Are you an instructor looking to use this book in your course? Everything you want in a human communication text-substantive, engaging, and fun. Let's Communicate is everything you want in a human communication text-substantive, engaging, and fun. Created by communication scholars Douglas Fraleigh, Joseph Tuman, and Katherine Adams, Let's Communicate takes their combined 100 years' worth of research and teaching experience to present all the basic human communication concepts with unique attention paid to technology, culture, gender, and social justice. A speech text that's absorbing, interactive-and affordable. 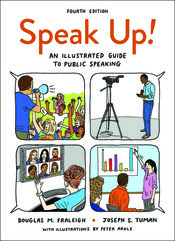 Written by professors with 40+ combined years' experience teaching the course, Speak Up connects with students through lively writing, compelling real-life examples, practical guidance, and hundreds of custom-drawn illustrations that bring public speaking concepts to life. 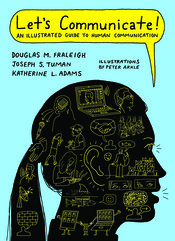 Instructors appreciate the book's serious coverage of concepts and theories, fascinating examples, and unique and often humorous illustrations that help students understand and retain concepts from the text.